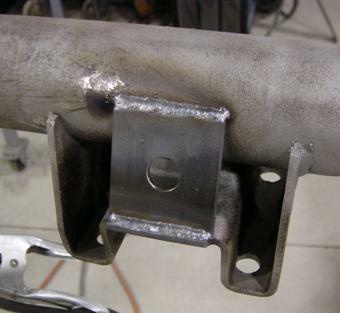 Here is how to brace a rear axle perch. If you don't do this mod, the perch may tear off! Width is 2.5" length top to bottom is 2.75", 3/16" thick. The hole is not needed, just thought it would look better. Do these front and rear of each perch. On the right above, I converted my engine stand to hold the rear axle housing for welding and prep. See my "interesting projects" page for more. 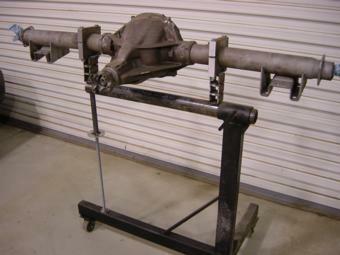 This is the 8.5" rear axle I rebuilt. New Eaton posi, Surpior axles, Timken bearings, TA cover, Baer brakes, new brake lines, housing center welded to axle tubes and perches braced to the axle tubes. I also welded a round eye to easily hook tie-down straps directly to the axle assy when the car is trailered. I hate wrapping slings or chains around the axle. Lines were routed to front and rear sides of the axle tube to allow the U bolts to be easily inserted. the baer kit has hose clamps to anchor the outer brake line fittings, I welded them on instead. Eaton does not supply left hand thread ring gear bolts with their positraction units, if you need ring gear bolts, DO NOT buy bolts with the SMALL STANDARD 5/8" head! GM uses a special 3/4" large head bolt with tiny "stair steps" in the underhead seat, this keeps them tight and supports the bolt. The 5/8" headed bolts only have .062" seat under the head and it will sink into the softer cast iron carrier after a while and come loose. When it comes loose, it will back out and be sheared off by the carrier bearing caps. Use GM # 1241564, or Mr Gasket bolts. I haven't been able to find ARP bolts for this axle. 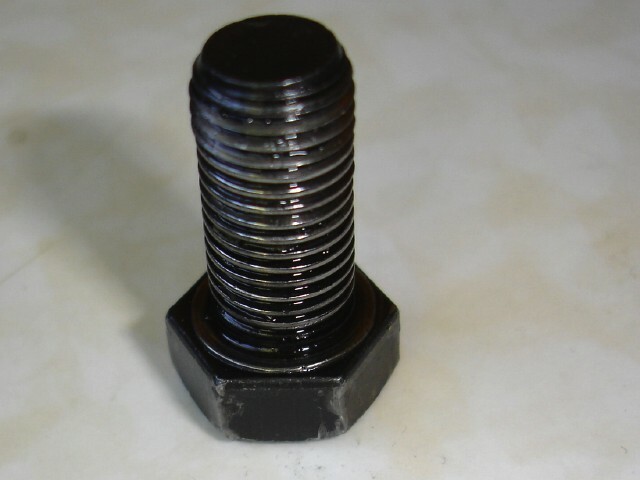 Bolts are 7/16" 20 X .850" LH thread. In a pinch, I have been told you can use grade 8 washers under the heads of the 5/8" headed bolts, but play it safe if you can with the proper GM bolts. Here is a Ratech bolt from Summit with the "small" 5/8" head.